The number grammatical category of a noun phrase indicates the quantity of the entities to which the noun phrase refers (see also 13•۶. Number of Verbal Phrases). 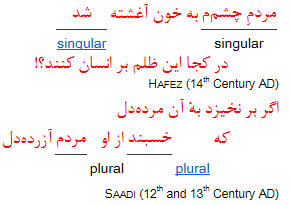 Singular refers to one single entity or a coherent set: کتاب, غلام, اسب, کاخ. 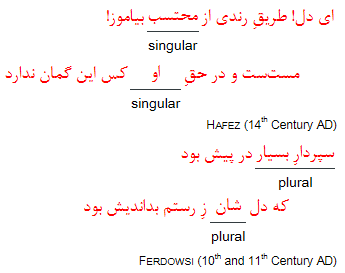 Plural refers to several entities, which are homogeneous or have common features: کتاب‌ها, غلامان, اسبان, کاخ‌ها. 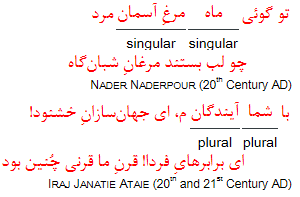 Dual refers to two homogeneous entities, although this has not been preserved in middle and New Persian (see Arabic dual ↓). A collective noun is a noun which only occurs in the singular, consisting of several homogenous or predicative complementary parts: لشکر, گروه, دسته, خانواده.